I will be doing the stats again this season. They wont be updated every monday or whatever, might take a little longer than last season. Formula's work the same as last season. If you feel like you have a better one, please enlighten us! Last edited by Majorcrisis2; 02-05-2019, 05:27 PM. Sharks are nearly impossible to do ratings for, IMO. It's perfectly possible to rate basing ships properly, I made the formulas for TSL but it was never implemented. I might have an error in the formulas. Will check this. @rab: ratings always gonna be an own judgement call if its good or bad. I will check your tsl one. You gave cripple my TeK the first match, BTW. Give me it back meow! Thanks for doing this MC! Looks like were still missing a Twdt-j game from gladiator? Last edited by afghan; 01-30-2019, 07:32 AM. Havent updated it since sunday, no time yet. All base games are missing there as well. The twdtj scorebox was uploaded after i went to bed sunday. 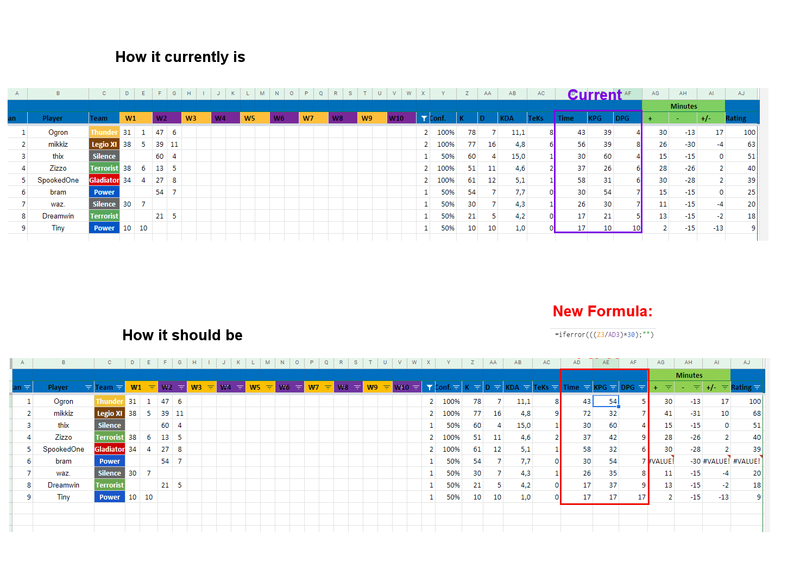 Rest will most likely be updated sunday. .
Can you change the KPG and DPG formula? It shouldn't be per game, it should be per 30 minutes, since gametime varies significantly. The spiders, terrs, etc. should be pro-rated to 30 minutes. For instance, Dreamwin went 21-5 in a 17 minute game. You list him with a KPG of 21 kills per game. While technically true, it's meaningless and not representative of the amount of kills per minute he's putting up. He's averaging 37 kills per 30 minutes, but I usually just still list it as KPG as it is simpler. Thix has 60 kills in a 30 minute game, and his KPG is 60. It's more meaningful to compare that to Dreamwin's 37 than his actual of 21. Inaccurate and unfair to punish players for winning sooner. Makes things much more consistent to prorate it to 30 minutes. Makes more sense yea. Spid has it, shark has it with rpd, guess their kpg should be to 30 min too. WB is updated to round 6. Rest is updated to round 4, will do the rest somewhere this week most likely. All the stats are updated. I also added the star rating next to everyone's name. This can be useful for next seasons (if we get any) and their ratings. So see if anyone needs to get higher/lower. @Ogron: I haven't changed the KPG for terr yet. I will do it somewhere in the future, can't promise when but will happen. Other thing is that I am doubting about the shark stats. It's kinda weird to have me and zidane on same rating. We kinda have the same stats on everything, but my win rate is higher. I think I should manage the winrate in the rating a little, not a big amount, but still. The main rating is RPD/30 min now, which is odd, since a losing shark often has more deaths so often a higher RPD/30 min. Also created the overall rankings. I have to think about the basing one though, now it just adds spid+terr+shark, which 'benefits' the rating of people who play all ships. For example turban has played in all, spid 52, terr 4, shark 12. Which makes his base rating 68. Which is obviously higher than his best ship. Dividing it to 3 makes no sense imo. Anyone has an idea for this?